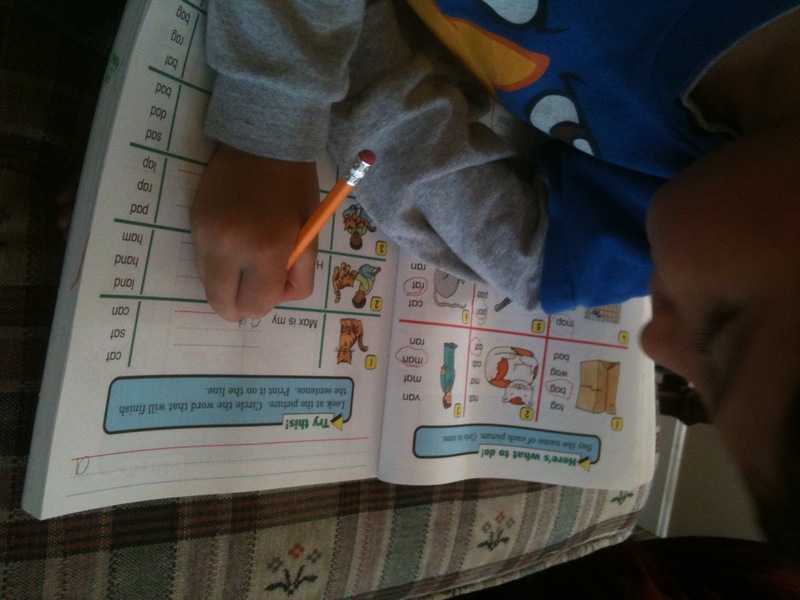 I had really wanted to be better this year about documenting our homeschooling journey. This is my last year in Kindergarten (*sniff*) and my first year in 7th grade (WOW!). Lots of changes all around to document for our family's memory book. But, fall is just crazy here! Ben runs cross country, Luke has football and Levi is playing soccer. We have Boys Scouts and Cub Scouts. My husband is starting a side business. I need to sneak out weekly to by groceries (my "alone" time). Thanks to E-Mealz.com (review coming soon), we've had a few more family sit-down dinners than last fall, but it is still wacky a majority of the evenings. And, since Ben is playing a public school sport, afternoons are quite full as well. I'm really thankful Ben is taking a writing class. He just wrote his first essay: why Peanuts is the best cartoon of all time. The teacher (and her dog, Penny) incorporates lots of great vocabulary, usage, and brainstorming techniques. She's way more fun that I would be at this point in the year. Levi's reading is coming along, and he is a lover of math. Some days I have to tell him, "No more math today!" but he doesn't listen. "Mom, I have to write my numbers up to 100 again!" Love him. Luke is hot-and-cold with reading. I'm still working with him to figure out what exactly is making reading hard for him. We're doing some Dianne Craft exercises (I found 3 of her DVDs at the used curriculum sale for $1 each! ), and it brings me back to my days as a speech pathologist. I always liked the diagnostic part of my job, I just never thought I'd have to use it with one of my own children. I wish it felll within my moral code (and budget) to offer Luke $10 if he read a book from cover-to-cover. He's working through the Karyn Henly's Day-by-Day Bible (the New Testament) and is reading aloud a portion of it to me. I need to be happy with that right now. Oh, and he has discovered Captain Underpants books. Ick. I was good at keeping this series away from Ben when he was younger, but not so much for Luke. At this point, I'm just happy he picked up a book! I want him to get interested in reading Magic Tree House books, but he is balking right now. I will have to pull out the Pizzza Hut reader coupons, I think, and offer those up for a reward. I love General Science with Dr. Wile. Right now, I'm using the tests to underscore the importance of studying. Ben is having to use the study guide (as well as flash cards) to review information. I also am making him take notes. I'd love to be a bit more hands-on with him for this process, and I hope we'll get there. Math is the easiest thing this year. That is a huge blessing for me. Ben's subjects this year are much more intense. With writing class, science and history/ literature (he's sort of doing two literature courses right now because we're reviewing a program), he has a lot of work! To balance this out, I've decided that for spelling, if Ben can take dictation and mark his words with no errors and explain to me the spelling rules that we're using (with decent accuracy), then I'm not going to give him a spelling test at the end of the week. However, he is still responsible for correctly spelling the words. During the week, I am still making him complete some of the reinforcements, especially ones that have to do with derivations, analogies, adding prefixes/ suffixes etc.. This is freeing us up to spend more time on history, writing and literature. Its amazing how content has become the big player for him this year; but not just that, it's learning how to learn all this content that is the big task. We're doing the science activities in Exploring Creation with Astronomy this year. Nothin' like lava flow! This kid is so happy when we are doing science-y things. I made a customized assignment notebook for my future Air Force pilot. The back has tons of scripture to encourage a pre-teen. The inside is pretty basic, but this is what he wanted. He is doing nearly all of his own scheduling of assignments; I wrote sequences for some of his subjects (like Grammar), but he is responsible for fitting it in during the week. Levi has been a drawing monster these past few weeks. He drew a mail truck and VW Beetle-like car this week for his birthday thank you notes. He drew a whole street scene today. Picassa isn't cooperating and rotating my pictures correctly, so I'll have to post those another time. you are the best mom! you have some lucky dudes in your family.